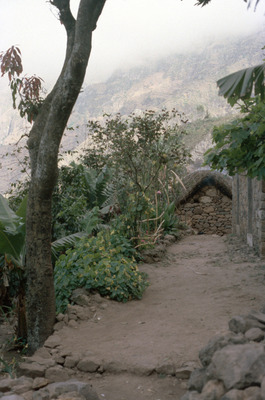 For the adventurous visitor, one can descend from Cova via the Ribeira de Paúl to Paúl. This is a breathtaking journey requiring about 3-4 hours, depending upon how well one's calf muscles hold out, and how many mini-stops for "grogue" one makes. The locals are very hospitable! These slides are only a glimpse of the spectacular and sometimes mystical beauty encountered by the visitor descending the Ribeira de Paúl on foot. Heavy mists sometimes play havoc with photography, but the journey is well worth the risk!